11 September - Another breezy day at Porthallow with westerly winds, although it swung more northerly later in the afternoon - indicated by the movement of ships at their moorings in Falmouth Bay (the state of the tide by then would have had them facing the south-west). As happened yesterday we had a procession of clouds passing over us which brought the occasional few spots of rain, but we had none of the heavy showers that had been forecast. 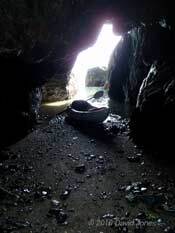 At low tide I was in Nare Cove and took the chance to investigate a narrow, sheltered channel between rocks which is only shallow enough to wade in during Spring tides. 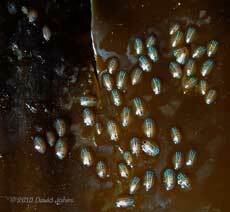 Having been amazed by the neon display of the single Blue-Rayed Limpet yesterday, you can imagine my surprise when I turned over a leathery frond of Laminaria to be faced with a large group of them! I don't know how significant it is, but most of the limpets were facing in the same direction - the stalk (and holdfast) of this frond would have been below the picture if the frond was extended vertically. 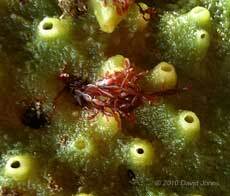 And there were others on nearly every frond I checked, as well as others on fronds of Serrated Wrack. All the examples I found were of a similar size, no more than about 4mm in length, slightly larger than the one I found yesterday. 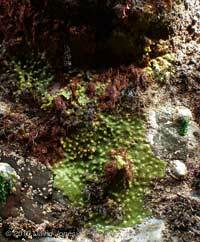 While most of the Laminaria was still submerged, a foot or so above the water, on a vertical surface were several patches of quite bright green Breadcrumb sponge (Halichondria panicea), one of the most common sponges you find on rocky seashores, especially in gullies and other sheltered spots. The example in the photograph is a thin encrustation typical of such a sheltered spot. In more exposed conditions it can be much thicker. The green colour is due to a symbiotic alga in the surface layers, and in deeper water the sponge is yellow. The surface of the sponge is punctuated by what looks like a random distribution of raised openings, each called an Osculum (pl. Oscula). The surface of the sponge also has very many tiny openings, or pores. Water enters through these pores, and leaves via the Oscula, with the flow of water maintained by specialized cell with hairs which also filter out food particles. Next to the sponge, and in a few places growing on it, was a very delicate red seaweed which could be Lomentaria articulata, a common species that usually grows to no longer than around 10cm in length. Here, a small example is developing between the oscula of the sponge. This is a species that is largely restricted to the south-west of Britain, the northern limit of its distribution. The size of this induvidual suggests that it is a female, and may be at least four years old. 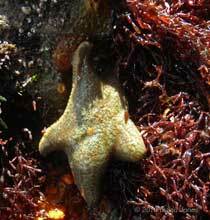 Cushion-stars are all males when they first mature at 2 years old and measure about 10mm across. Then they change to female two years later when about 20mm across. They can live for around 7 year. 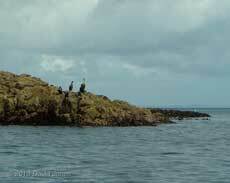 Finally, before heading back to Porthallow I paddled to Mermaid Point, trying to get close to a group of Cormorants. There is no change of a close approach, and you know that they are about to leave when they defeacate. Moments later, rather than fly off they jumped into the water and dived! Moments later a noisy trio of Oystercatchers appeared from behind the rocks, flying out to sea and followed by a Curlew, the first one I've seen this holiday. 12 September - A mainly sunny, but slow, slow day, with us not setting out until after 3pm when we headed down to Lizard Point for a meal, after which I went for a walk to see if the Choughs were about. I spotted the pair in the same field as last week, but this time much closer to the footpath. Great, I thought, but then I noticed someone watching them over a gate at the top of the field. 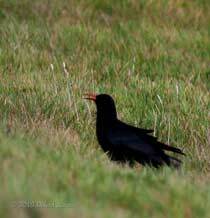 That person's movement (and bright top) must have disturbed the Choughs and they flew further across the field. Nevertheless, I walked around to the spot that I photographed them from last week and waited. A few minutes later their heads started appearing over the top of a ridge. 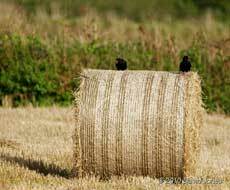 However, rather than coming closer they took off and flew to an adjacent field where hay has recently been cut and baled, landing on one of those bales. They stayed on it just long enough for me to take a couple of photographs before they flew down into the stubble where they all but disappeared for a while. Afterwards they spent some time back on the cliffs where I saw a bit of bonding behaviour in the form of courtship feeding before they headed back over the fields and away from the area. 13 September - A trip to Porthleven, a harbour on the west coast of the Lizard (no photographs taken) before heading back to Lizard Point for a meal. 14 September - A damp, misty morning helped us decide to take a trip to Falmouth where we visited the National Maritime Museum - a fascinating place which will be well worth another visit in the future. 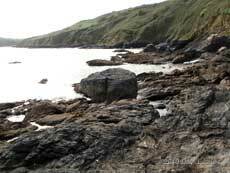 15 September - Another day on which we spent the morning down at Porthallow before headed to Lizard Point for a meal. On this occasion I decided to start off by taking a couple of pictures of the cove itself from positions used to produce postcard images back in the early 20th century. This first one, from the coastal path above the cliff on the north side of the cove. On the skyline (top-right) you can just make out the village of St. Keverne, the 'hub' of this part of the Lizard, and linked to the cove by a very narrow, winding road. This second view was taken from just above our car, which you can see parked near the water on the south side of the beach. I extended this view to include the piece of coast I paddle along, as well as the distant shores on the other side of Falmouth Bay. 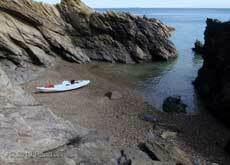 Then it was a out onto the flat sea for a relaxing paddle, only as far as the first small headland on the north side. Here I'm looking back towards Porthallow. 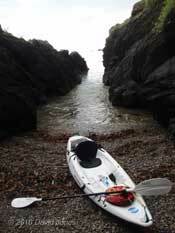 and the complete lack of any swell meant that paddling into the caves was as easy as it could get. While there seems to have been a distinct lack of Buzzards around Porthallow during this holiday, every trip on the kayak has been rewarded with sightings of Oystercatchers, and several Curlews. It has been a bit frustrating that I haven't been able to get a good view of the Curlews before they see me. I must get myself a pair of waterproof binoculars before next year's visits. 16 September - Today started with a return trip to Porthleven (to buy more knitting yarn from a shop visited on the previous trip here) before heading for Lizard Point. 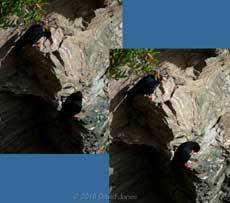 The Chough pair seem to be quite predicable at the moment. Once again the pair landed in the same spot to feed where I'd already photographed them on the 6th and the 12th. There were a bit too far away, but my hopes were raised when one of the pair flew closer to me. Here, it started to feed but also frequently called and displayed in the direction of its partner before gradually moving back over to join the other bird once again. 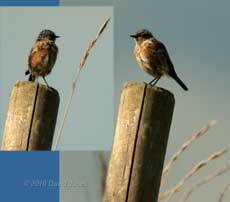 A short time later the pair were disturbed by a group of Jackdaws and headed to the cliffs. I headed back to the cliff top path and joined another pair of photographers. We soon found the pair together on a small ledge near the nesting cave, where they spent several minutes preening before heading to other spots along the cliff. At this point I headed back to the cafe for a meal! In the water below the cliff-top car park a couple of seals entertained the humans by doing very little more than just resting at the surface. and its frequent yawns suggested that it was either weary or bored! 17 September - With the sea remaining calm, and despite it being mainly cloudy I took the chance to get out on the kayak for one last time this holiday, in the longest session so far. Yet again the Oystercatchers and Curlews made themselves seen and heard, and several Cormorants waited until I passed close by before they too headed off. 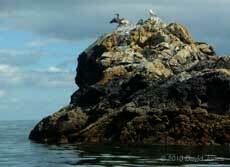 I was able to get quite close to this one although I didn't risk paddling around the rock for a better view. Another bird worth noting was a Swan. At the beginning of the holiday I mentioned the four Swans in Porthallow Cove. While there have been Swans there every time we've been there over the last two weeks, the number has actually varied, and today there were only two, and we have not see any of them flying. 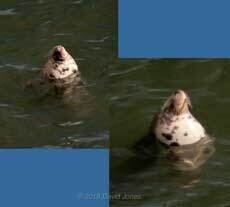 Today, while I was out on the kayak I spotted a third one, way out from shore and swimming towards the cove. It seems that they move between Porthallow and the area north of Nare Point, possibly Gillan Creek or the Helford River. Sheila confirmed that the Swan joined the pair in the cove a short time later. 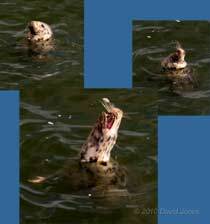 Another fascinating sighting was of a fish that I saw jump out of the water. This isn't an unusual sight, the fish usually escaping a predator. However, this fish remained out of the water for a long time, travelling at least 10 - 15 yards with just its tail in contact with the water. It seemed to be a long and skinny fish but was too far away to get a good view. The highlight of the trip, in fact of the holiday, was an amazing episode that occurred early during the outing while I was several hundred yards off shore. I suddenly became aware that there were Swallows flying about me. When I stopped paddling I realised that there were literally hundreds of them, spread out over quite a large area, and flying low over the water. While they were clearly feeding, it was also obvious that the group were moving south. I called Sheila on the radio and she watched them as they flew past. The coast on the south side of the cove sticks out a bit towards the east, and some of the birds moved over land, although many clearly remained over water. I can only speculate, but their feeding may have been linked to the westerly breeze that was blowing. This sweeps down the valley leading to Porthallow and whenever I'm kayaking in these conditions I come across quite a few insects that have been blown out from land. Once the group had passed I saw very few stragglers, and just one or two that seemed to fly back north. Given the timing of what I saw I must assume that this was a mass migratory movement. as well as the caves that I can't keep away from. 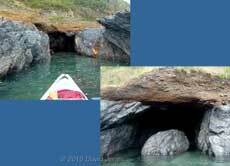 And finally, the calm water allowed me to take pictures that I could paste together to give a kayaker's eye view of Porthallow Cove. 18 September - A cloudy day on which the morning was spent packing ready for our return home the next day. This task more or less completed, we headed down to Lizard Point for the rest of the day. 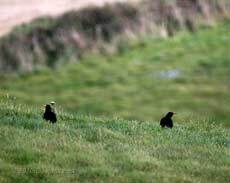 I walked ashort way along the cliff path to spot the Choughs one last time, but this time all I saw was a distant view of the pair heading off across the fields and away to another part of the coast to the west of us. I satisfied myself with a couple of hand-held shots of this small bird before it too disappeared from sight. It appears to be a juvenile. At first I wondered if it was a young Robin, but I don't think it is. However, beyond that possibility I'm at a bit of a loss! 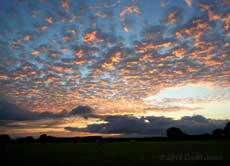 19 September - This was the view of the dawn skies over the field just behind our bungalow as we made an early start on the long journey home after a better holiday that I had hoped for.